As Christmas cards and holiday letters from faraway friends and family begin to arrive in my mailbox, I'm reminded once again of how much I love receiving handwritten notes. In today's 'instant' society, with communicating reduced to emails and cell phone texts, our outside mailboxes now contain mostly junk mail and any bills one hasn't changed over to 'paperless' delivery. 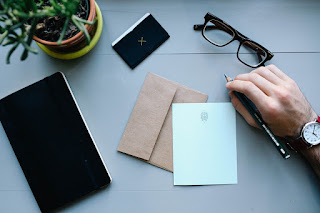 Seldom do we find a real letter today arriving as 'snail mail', except greeting cards for holidays and birthdays, perhaps with a handwritten note. 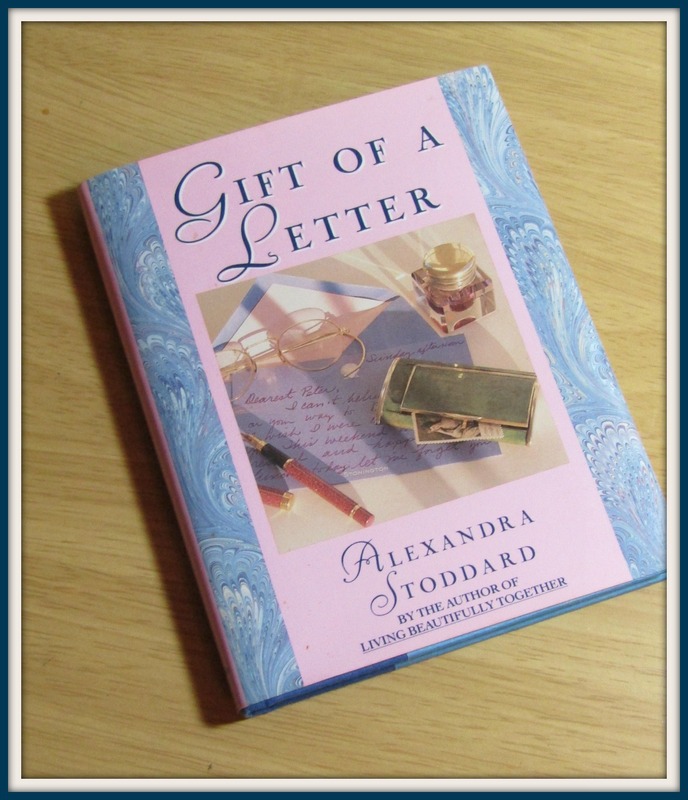 In her book "Gift of a Letter", Alexandra Stoddard tells us about the 'power' of a letter and includes the elements of letter writing and how it touches those you love. 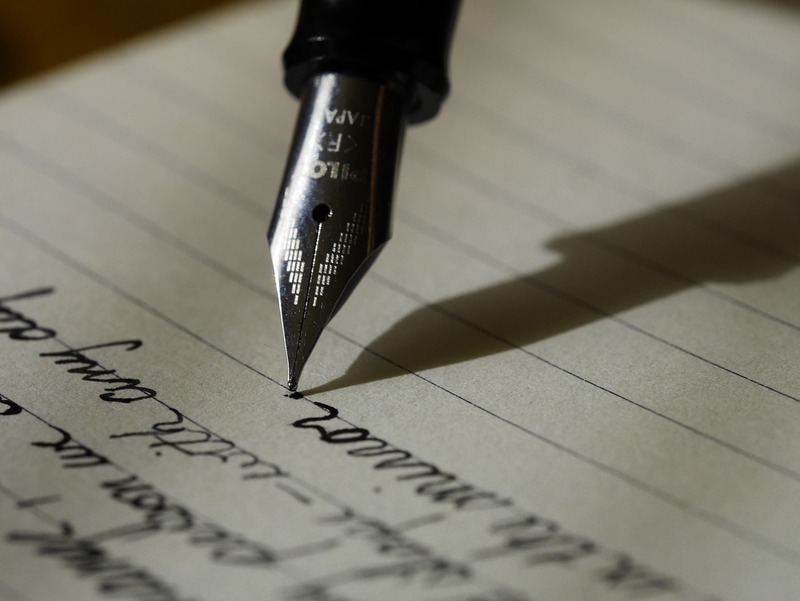 Letters are the most natural form of autobiography, allowing us to be personal and specific. The author tells us that by writing a letter to a friend, it brings that person into your day! The scenes and stories told linger as long as the letter, and beyond! It's a special way of sharing ourselves with others. A phone call is a convenience, an email or text is quick, but a LETTER is a Gift! It's never interrupted, it doesn't require immediate attention, and it can be saved and savored. It's a treat with no strings attached. Letters are sent to people we want in our lives and a way to stay close to friends who mean so much to us. Re-reading old letters can remind us of past pleasures and memories. The nostalgia it produces can be a wonderful reward. Author Stoddard states that "there is always time to write, just as there is time to enjoy life." 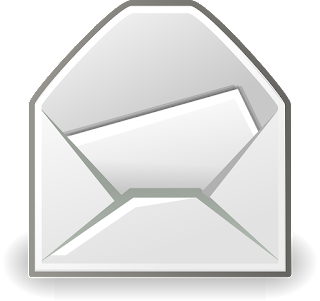 The importance of receiving letters became immediately apparent to me my first week in college living in a dormitory. Suddenly I found myself over 1,000 miles away from home ~ for the very first time. Going away to college is an adventure and a wonderful feeling of being independent and 'grown up'. But you don't realize until then also how lonely those first few weeks can feel. The first letter-from-home I received was such a happy moment. Before I even read the letter, the feeling of being loved and 'remembered' nearly overwhelmed me. Such a small thing, that letter, yet it instantly connected me with my faraway family in a way I've never forgotten. After that day, mail call became my favorite part of each day. The anticipation of receiving a letter got me through some difficult adjustment times in the beginning. And it set up an expectation I've never gotten over -- so much so that even today, 50 years later, I still hope to find a real letter or handwritten note in my mailbox. With today's instant communications, it doesn't happen very often, but when it does it's a very special moment. Because of the joy I've always felt from receiving letters, all my life I have been a letter-writer. Even with the quick availability of emails and such, I just enjoy mailing out everything from long letters to a couple lines on a postcard to cute greeting cards all year long to my grandsons. Kids LOVE getting mail addressed to them. It makes them feel someone knows them for themselves. Letters don't have to be long to be enjoyed and appreciated by the recipient. How many of you have done as I have and stuck little 'smiley face' notes in our kids' lunch pails or a quick "I Love You" note in our husband's briefcase. Coming across little notes like that is sure to be a sweet surprise and undoubtedly will bring a smile to their faces. When Alexandra was just five years old, her godmother sent her a note inviting her to visit for the weekend. She remembers vividly that her full name was spelled out on the envelope and the letter was signed by an adult she loved. To her godmother, she was a real-live person, not just her parents' little girl. That letter instilled in Alexandra a passion for letter writing and receiving she has had her entire life. At age 75, she continues with her writing, seminars and lectures which contain a positive personal philosophy of ways to live a beautiful and happy life. For a list of her other books available on Amazon, click here. 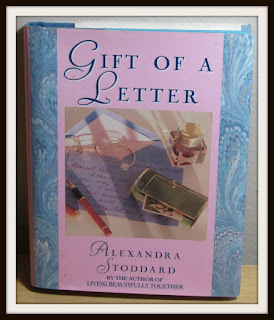 This book "Gift of a Letter" was published in 1990 and today is hard to find. Some sellers on Amazon and others on eBay still have copies. Other books on the subject of letter-writing ARE readily available, as seen in the list below. But I DO like my little book, as it's a wonderful reminder for me to dash off a note or send a card with a hand-written message or even write a long letter to a dear friend I've been missing. The time it takes to do so is rewarded ten times over by the joy the recipient has when the letter/card/note arrives in their mailbox! It has been years since I received a real letter in the mail, and just as long since I sent one. I very much remember how exciting it was to receive a letter from one of my pen-pals. You are quite right. It was a cherished gift from a friend. I do get greeting cards with little notes which I very much appreciate, but I admit, I am not very good about sending them. This is an excellent reminder of how important letters, notes, and handwritten greetings can be to the recipient. What lovely reminder of something that I used to do quite often. I'm not sure why I ever stopped sending letters, but I did. As much as I love getting a letter (that hasn't happened in I can't say how long); I loved writing the letters to my family and friends. About a month ago, I was helping my Dad clean and I came across a box which was filled with every letter that I have written him over the years. Dad has considered those letters gifts, too. He said that every once in a while he sits down and reads them over again which really touched my heart! Your post has reminded me that I really should pick up that pen and paper and start to write letters once more. Thank you Miss Elf! I'm sorry to say that I've fallen out of the practice of writing letters, though I did write a few to my mom before she died. Probably the favorite letter that I received in my life was from my soon-to-be mother-in-law who wrote, welcoming me into the family and letting me know that she would be honored if I called her "Mom." That letter truly was a gift and I know that every letter my mom received in the final months of her life were gifts that meant the world to her, too. This is a precious review that I think will speak to everyone who reads it. Thank you for sharing this wonderful book, Elf. Well, I seem to have struck a chord of remembrance for everyone -- that the joy of both receiving and sending handwritten letters is a delightful practice we all want to renew. Thanks, everyone for sharing some of your letter memories with me. Wonderful review... and wonderful reminder of how much handwritten notes are so important. I spent most of my years until 1991 as a faithful correspondent. During high school, college and my first years of marriage I often spent hours a day writing letters. That slowed down a bit when the kids came, and came almost to a halt when I started at Squidoo. Now my arthritis is so bad that handwriting letters is just too difficult. I have only one friend I still write to, and only because she refuses to get an email account. I remember how important getting letters used to be. In letters people took time to think about what they were going to say and how to say it. I know I did. Much different than a tweet or Facebook post. I don't think I've ever thrown a letter away. Old friends and departed loved ones still speak through them. The mail delivery was the high spot of my days. Now I almost wish I didn't have a mailbox. The mail now is something to sort and throw most away. Until my aunt died, she and my mom wrote to each other every day as part of their routine. For Mom, one of the hardest parts of losing her sister was starting to write that letter and realizing there was no one to send it to. I encouraged her to journal after that, and she did. I hope this wonderful reveiw will motivate me and others to begin sending a few real letters again. They really can make someone's day. They are really gifts of oneself. Many people spend money on gifts, but few people spend time -- the greatest gift of all. What a wonderful reply, Barbara. I can tell you enjoy writing letters by the long and thoughtful comment you left here. I agree with everything you said - the time we take to write a letter or note to someone truly is a 'gift' we send them -- a gift of ourselves. Thank you. I'm pleased you liked this article, Mary Beth. It seems we all miss getting real mail delivered to our mailboxes. Perhaps we can revise the actual writing of letters to friends and family. Even small notes are appreciated. What a wonderful book review on the Gift of a Letter, Pat. Each time I have received a personal letter, card, or postcard note it has made my day. My sending and receiving of such has dwindled over the years. Lately I have been thinking of a new postcard selection. Running across your review was perfect timing for my own thoughts. I need to just do it! Thanks so much for visiting, Ruth. I LOVE getting 'snail mail'. Glad to hear my review was a helpful inspiration for your own work.